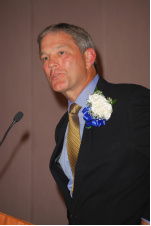 STORRS, Conn. - Former University of Connecticut football student-athlete Kirk Ferentz, who now serves as the head football coach at the University of Iowa, was honored by UConn's Neag School of Education as its Distinguished Alumnus on Saturday night. A native of Royal Oak, Mich., Ferentz attended Upper St. Clair High School in Pittsburgh. He graduated from the University of Connecticut in 1978 with a bachelor's degree in English education. He was a team captain and an Academic All-Yankee Conference linebacker at UConn. Ferentz will be entering his 11th year at Iowa in 2009 and he also served as the head coach at Maine from 1990-92. He began his coaching career as a graduate assistant coach at UConn in 1977 and was an assistant coach at Worcester (Mass.) Academy from 1978-79. A graduate assistant at Pittsburgh in 1990, Ferentz first came to Iowa as an assistant coach from 1981-89 before taking the Maine job. He was also an assistant coach in the NFL for the Cleveland Browns/Baltimore Ravens from 1993-98 before taking the Iowa job. He was the 2002 Associated Press and Walter Camp Football Foundation National Coach of the Year. He has led Iowa to a pair of Big Ten championships and seven bowl games during his tenure.